When a US Naval captain shows signs of mental instability that jeopardizes the ship, the first officer relieves him of command and faces court martial for mutiny. NYTimes: This tale of the tensions and turmoils among the officers and crew of a Navy destroyer—minesweeper in the Pacific in World War II is a compound of several personal dramas and conflicts of male temperaments, all drawn to a fine, explosive crisis during a violent typhoon at sea. At the core of its swirling rotation are the bravery and cowardice of men. Slant: Bogart started out his career playing nervous villains sweating their way through packs of cigarettes as they waited for their bad karma to catch up with them. Nearing the end of his career (and his life), Bogart finds a little of that cowardly rat in Queeg. Yet he also finds a militant forcefulness in this role, bringing to it some of the world-weariness of Rick from Casablanca, minus the ideological code and veiled idealism. And, on top of that, he layers on some exhausted sense of pathos: “The captain’s job is a lonely one,” he sighs during a more paternal moment with the new ensign (young would-be star Robert Francis). Bogart was not just one of the great movie stars, but also one of the great actors. 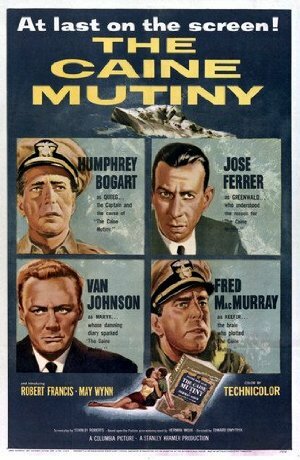 The Caine Mutiny surrounds him with other compelling players, such as the effortlessly authentic Johnson—every bit as good a character actor as Bogart, minus the charisma of a star. MacMurray, so dull when playing good guys, really comes to life when playing a fast-talking sneak. Rounding out the respectable cast is Jose Ferrer’s efficient, sardonic defense attorney. The main reason the film still excites today is because it offers the chance to see some of the finest studio actors working at the top of their game. The entire subgenre of WWII-era studio pictures at sea were never really about the boats, or even about the seafaring way of life. They were about the stars, and The Caine Mutiny is, as Queeg suggests, carried above the level of “standard” by its excellent performances. This is the one that convinced me that Humphrey Bogart could act. Yet another MoonOrb Movie I've been meaning to see! I've watched the pivotal scene before, but it really doesn't have much punch, so I imagine that "the rest of the movie" is a pretty good setup for it. In the novel the Caine was a converted WWI destroyer. We basically gave a bunch to the British as part of Lend-Lease. I presume that there weren't any seaworthy examples left by the time they made the movie, which used a more modern WWII-era destroyer instead. Now imagine the typhoon scene in the ancient ship Wouk described in the novel. Speaking of which, the novel is a good read. The movie is roughly the second half of the book, which starts as Willie Keith joins the navy after meeting his girlfriend, covers his officer training, and his assignment to the Caine, where he doesn't think much of Queeg's predecessor. I love Max Steiner's jaunty march that opens and closes the movie, but it's a stark contrast to the drama. Well it only took me a year and a half, but now I can say it really does a disservice to the movie as a whole for pop culture to focus only on the last part of it. One of the things I've heard about Full Metal Jacket is that it most accurately portrays the boringness of military life, so it's cool to see that take center stage here, too. It sure must have been interesting to be post-blacklist Edward Dmytryk, making movies about sassy layabout servicemen. Fred MacMurray is a master of the knowing-glare. "I...I never thought of that." And what a tremendous heel turn in the hearing, rounding out such a great character. "Here's to the real author of The Caine Mutiny." The practical effects for the ship in the typhoon must have been cutting edge in 1954, I bet they looked AMAZING at the time. This movie also contains apparently the only film of a Glacier Point fire fall.